Architects - Save Time, Energy and Money with Modelo! An ongoing problem that has forever pained the AEC industry centers around the question, how can AEC organizations land more projects? The follow-up questions tend to pivot around how to strengthen client communication and client engagement earlier in order to build client relationships, reduce the margin of error in illustrating a client’s vision, and ultimately improve the overall first presentation. This all in the hopes of rising to the top and standing out among your competition to be awarded the all elusive design contract and receive that letter of intent. As architects, there is nothing more important than early dialogue and active engagement with your client during the bidding process. AEC organizations must understand their client aspirations, their needs, and design a place that fits into those needs. With Modelo, client project communication throughout the entire design is centered in a web-based platform with clients and team members alike, accessible through any mobile device. Modelo allows the client to very easily be immersed in a design and truly feel what that space is. It allows for the client to explore parts of the design at their own pace and at their own leisure. 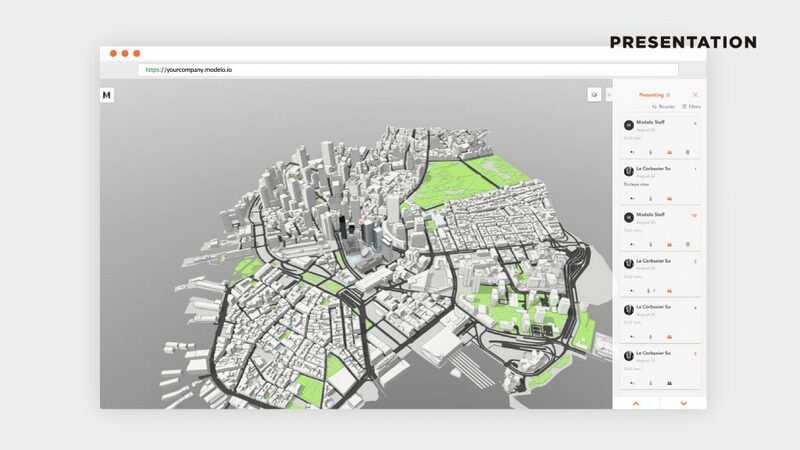 Client feedback is easily given in real-time and viewed by the entire project design team, allowing clients to engage from the beginning, rapport to be built stronger than ever before, and for interactive 3D architectural presentations to be delivered smoothly and directly in line with client expectations. In presentation preparation, architects have to anticipate what the client is most interested in and spend a lot of time delineating the issues the architect thinks is important which usually leads to a prescribed fly through, the animation is run by the architect but can’t really deviate from that because CAD programs like Rhino, Revit, and SketchUp are very tedious to navigate and too time-consuming to change on the fly. If the client asks to see a view that isn’t prepared then you will be out of luck and the presentation will suffer. By using Modelo, in seconds you will be able to create that special view the client requests during the meeting keeping he presentation flowing forward. 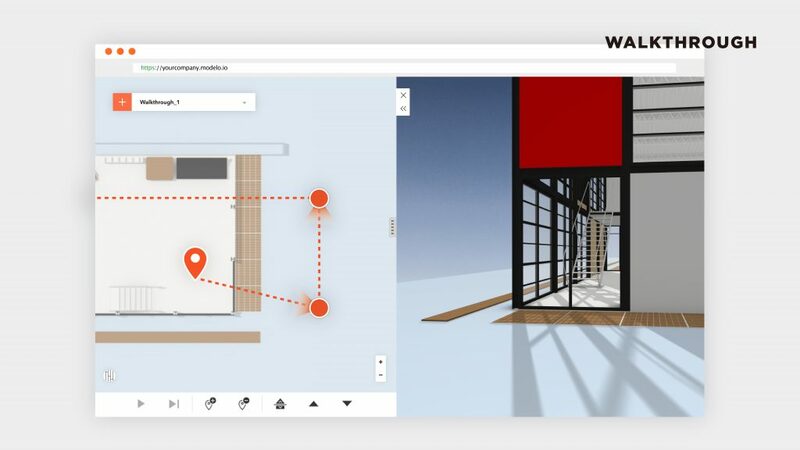 In comparison, Modelo is very user-friendly which allows new 3D walkthroughs, views, and screenshots to be made in seconds, giving your clients presentations the most flexibility of any program currently on the market. Simply put, Modelo improves your chances to win new clients and new projects by promoting enhanced client communication in the early stages which in turn builds rapport, as well as delivering beautiful initial design presentations. Having a leg up on your competition in the way you communicate and engage your client leads to a closer client relationship, a design in closer alignment with the client’s vision, and a clearer presentation which meets and surpasses expectations. When put to use with Modelo, this simple formula will lead to an improved chance to win projects in a given year; Modelo = more projects = more money. Modelo’s originally unique and effective way to communicate and engage with clients is entirely new to the AEC industry and changing the standards for how companies engage their clients. The only way to truly understand is to sign up to Modelo for yourself, upload a model, and dive in to the software to familiarize yourself with the product.  Archived in Modelo (Product). Bookmark the permalink.